Staff Selection Commission (SSC) has released STENOGRAPHERS ( GRADE 'C' & 'D' ) EXAM., 2014 MARKS/MISTAKES ( IN PERCENTAGE ) OF QUALIFIED/NOT-QUALIFIED CANDIDATES on 17th February 2015 on the official website. Those candidates who had appeared in examination but did not get qualifying marks, they can check their score in the PDF File which direct download link is provided in the end of the posts. 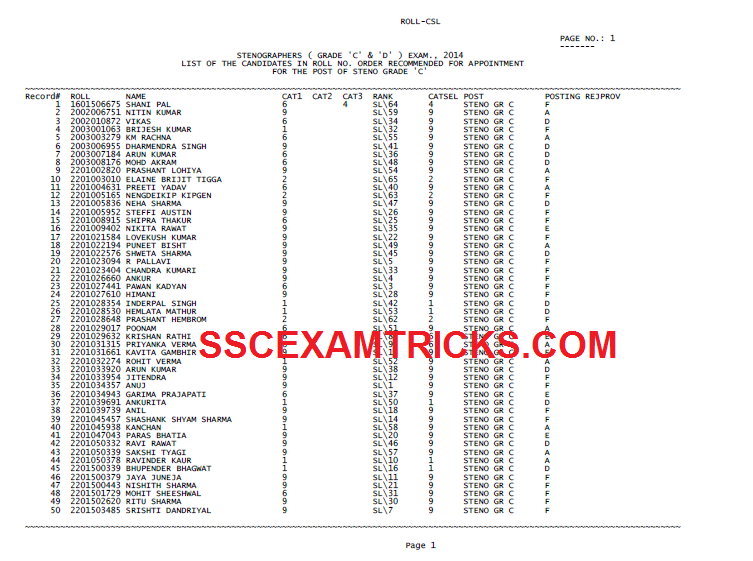 Earlier SSC had released Final result or Final list of selected candidates based on the performance in skill test in stenography conducted on 18th December 2014 for 536 posts of Stenographer in GradeC and D. A total of 577 candidates are finally selected for the posts of Stenographer GradeC and D. A SSC had also released the final cut off marks required for final selection of the candidates on 13th February 2015. Earlier SSC had released notification advertised for 38 posts of Stenographer Grade C and 496 posts of Stenographer Grade D in EMPLOYMENT NEWS/ROZGAR SAMACHAR DATED 31.05.2014. A huge number of candidates had applied for these posts. Written Exam was conducted on 14th September 2014 for the posts of Stenographer Grade C & D. The exam result was declared on 26th November 2014 in which 2,602 candidates were shortlisted for skill test for the post of Steno Grade ‘C’ and 24,875 candidates were shortlisted for skill test for the post of Steno Grade ‘D’. A total of 790 candidates appeared for Grade ‘C’ skill test and 10,300 candidates appeared for Grade ‘D’ skill test. Those candidates who had appeared in the skill test and waiting for their final result, they can download their final result from the direct link provided in the end of the posts. SSC is in process to release appointment letter to these finally selected candidates along with the instruction to receive appointment letter / joining date for these posts. The Final Selection is to be done on merit basis based on performance in written examination and Skill Test in Stenography. There will be NO INTERVIEW for the final selection of SSC Stenographer Posts. The exam was conducted by Pen MODE. Paper was of multiple choice questions (MCQ) of 200 marks given in Part 1, Part 2 and Part 3 in which question contained various question to check mental ability of examination. In exam four options were provided to choose one right answer among them. The total time for each examination was 2 hours or 120 minutes. The short listed candidate was called for Skill Test (ST). A typing test was conducted to check the typing ability and accuracy on computer typing of the candidates. The candidates was given one dictation for 10 minutes in English / Hindi at the speed of 100 w.p.m. for the post of Stenographer Grade C and 80 w.p.m. for the post of Stenographer Grade D. The matter was transcribed on computer only. Selected candidates was required to bring computer generated online application, result print, original documents (10th, 12th, UC DMC, Cast certificate –If applicable etc.) and one set of self-attested of all the documents to the venue of skill test for verification of originality of candidates. The Finally Selected Candidates for the posts of Stenographer Grade C and Grade D should bring and deposit the list of document which is provided below at the time of receiving appointment letter from the authority. The appointment Letter will contain the date of joining and reporting time along with venue of appointment. The candidate will have to report at the venue mentioned in the appointment letter on the fixed date.